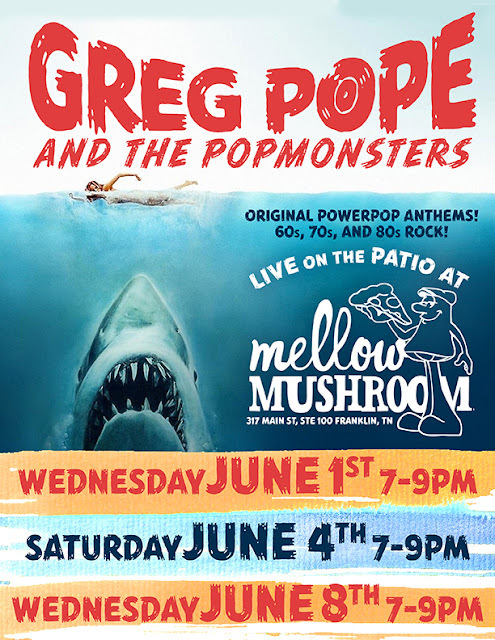 POPMONSTER: GREG POPE: ROCK with us THIS JUNE at MELLOW MUSHROOM! ROCK with us THIS JUNE at MELLOW MUSHROOM! For three very special evenings in June, we'll be filling in for my son Asher's band, the Wacky Friday at the downtown Franklin Mellow Mushroom. We will not only be doing the anthemic original rock you're used to but also some GREAT cover tunes from the likes of QUEEN, THE POLICE, and ELO just to name a few. NO cover charge! NO excuses! JOIN US!! ROCK WITH US NASHVILLE...THIS SATURDAY!